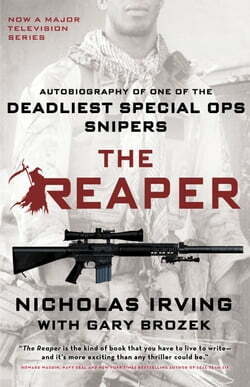 ‘They call me The Reaper ...' The Reaper tells the incredible true story of the legendary Nicholas Irving, and his journey from wayward Maryland kid to the 3rd Ranger Battalion's deadliest Master Sniper. Irving delivers a gripping first-person account of his development as an expert assassin.... read more Once deployed, his romanticised expectations of life at war are torn apart. Enduring extreme physical and mental conditions, he learns the true meaning of discipline and focus. From the brotherhood and selflessness of teammates in battle to the cold reality of taking one life to protect another, no other book so dramatically lays bare the experiences of a sniper on point. Nicholas Irving spent six years in the Army’s Special Operations 3rd Ranger Battalion 75th Ranger Regiment, serving from demolitions assaulter to Master Sniper. He was the first African American to serve as a sniper in his battalion. He lives in San Antonio, Texas. Gary Brozek has co-authored nearly 20 books, including five New York Times bestsellers.